This weekend, the sun finally poked out so baby Isabella and I were out for a walk. As babies do, she took a nap (we were at a noisy ball field, so a long walk around the back end of park was a lot quieter for both of us.) 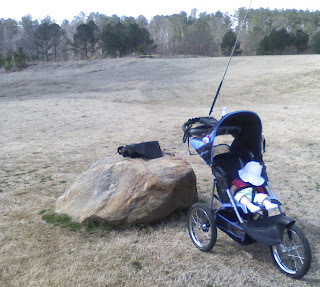 Also on the back of the All Terrain Baby Carriage was my FT-817 and a MFJ-1899T with a counterpoise. The MFJ-1899T, is is a fascinating mini-antenna for on-the-spot HF'ing. It is made by Waters and Stanton of the UK and imported to the US by MFJ Enterprises, I got mine at HRO. This multiband rig is similar to a miniature Outbacker, with band taps along its lower helical winding section, a jumper lead for selecting bands (wander wand), and a top mounted pull-up whip. The base is fitted with a BNC connector to mate with the FT-817’s front socket. The MFJ-1899T “Walkabout” antenna covers 80 through 2 meters in a single “break apart and carry anywhere” package. Fully extended, it measures 63 inches in height. Retracted and separated, the helical base section is 12 inches long and the pull-up whip is 7 inches long. Adding a BNC-to-PL-259 plus a right angle PL-259 adapter and connecting it to the stronger SO-239 socket of the FT-817 relieves strain. That same idea also works for adapting the MFJ “Walkabout” to other transceivers (FT-857). But dial it down the output below the antenna’s limit of 25 watts. It is the counterpoise, that is the key to making this little antenna perform. -- The instruction sheet suggests it need not be 1/4 wave long. In fact, the info sheet suggests using the formula 180/F(in MHz) = Length (in feet) of the counterpoise. I use a 16ft section for 40m & 20m and seems to work well enough, I used stainless steel cable covered in Teflon available at HOME DEPOT. Isabella, slept for a little over an hour and half. When she awoke, we walked back to where the rest of the family was enjoying the ball games. She was rested and I was very happy to have worked a few stations on 20m QRP. NOTE: I also listened for k4ESA on 10m, but did not hear anybody local, just lots and lots of South American stations calling, 10m is working well in the afternoon.